Bosphorus in Istanbul, connecting Europe and Asia. The Bosphorus Bridge (Turkish: Boğaziçi Köprüsü), known officially as the 15 July Martyrs Bridge (Turkish: 15 Temmuz Şehitler Köprüsü) and unofficially as the First Bridge (Turkish: Birinci Köprü), is one of the three suspension bridges spanning the Bosphorus strait (Turkish: Boğaziçi) in Istanbul, Turkey, thus connecting Europe and Asia (alongside Fatih Sultan Mehmet Bridge and Yavuz Sultan Selim Bridge). The bridge extends between Ortaköy (in Europe) and Beylerbeyi (in Asia). It is a gravity-anchored suspension bridge with steel towers and inclined hangers. The aerodynamic deck hangs on zigzag steel cables. It is 1,560 m (5,118 ft) long with a deck width of 33.40 m (110 ft). The distance between the towers (main span) is 1,074 m (3,524 ft) and the total height of the towers is 165 m (541 ft). The clearance of the bridge from sea level is 64 m (210 ft). Upon its completion in 1973, the Bosphorus Bridge had the fourth-longest suspension bridge span in the world, and the longest outside the United States (only the Verrazano-Narrows Bridge, Golden Gate Bridge and Mackinac Bridge had a longer span in 1973). The Bosphorus Bridge remained the longest suspension bridge in Europe until the completion of the Humber Bridge in 1981, and the longest suspension bridge in Asia until the completion of the Fatih Sultan Mehmet Bridge (Second Bosphorus Bridge) in 1988 (which was surpassed by the Minami Bisan-Seto Bridge in 1989). Currently, the Bosphorus Bridge has the 25th-longest suspension bridge span in the world. After a group of soldiers took control and partially closed off the bridge during the military coup d'état attempt on 15 July 2016, Prime Minister Binali Yıldırım announced on 25 July 2016 the decision of the Cabinet of Turkey that the bridge will be formally renamed as the 15 Temmuz Şehitler Köprüsü (July 15th Martyrs Bridge) in memory of those killed while resisting the attempted coup. The idea of a bridge crossing the Bosphorus dates back to antiquity. For Emperor Darius I The Great of Persia (522 BC–485 BC), as recorded by the Greek writer Herodotus in his Histories, Mandrocles of Samos once engineered a pontoon bridge across the Bosphorus, linking Asia to Europe, enabling Darius to pursue the fleeing Scythians as well as position his army in the Balkans to overwhelm Macedon. The first project for a permanent bridge across the Bosphorus was proposed to Ottoman Sultan Abdul Hamid II by the Bosphorus Railroad Company in 1900, which included a rail link between the continents. Opening day of the bridge. Since April 2007, a computerised LED lighting system of changing colours and patterns, illuminates the bridge at night. The decision to build a bridge across the Bosphorus was taken in 1957 by Prime Minister Adnan Menderes. For the structural engineering work, a contract was signed with the British firm Freeman Fox & Partners in 1968. The bridge was designed by the British civil engineers Gilbert Roberts, William Brown and Michael Parsons, who also designed the Humber Bridge, Severn Bridge, and Forth Road Bridge. Construction started in February 1970 and ceremonies were attended by President Cevdet Sunay and Prime Minister Süleyman Demirel. The bridge was built by the Turkish firm Enka Construction & Industry Co. along with the co-contractors Cleveland Bridge & Engineering Company (England) and Hochtief AG (Germany). Thirty-five engineers and 400 men worked on the project. The bridge was completed on 30 October 1973, one day after the 50th anniversary of the founding of the Republic of Turkey, and opened by President Fahri Korutürk and Prime Minister Naim Talu. The cost of the bridge was US$200 million ($1.13 billion in 2018 dollars). Upon the bridge's opening, much was made of its being the first bridge between Europe and Asia since the pontoon bridge of Xerxes in 480 BCE. That bridge, however, spanned the Hellespont (Dardanelles), some distance away from the Bosphorus, and was the second bridge after the above-mentioned bridge built by Emperor Darius I The Great across the Bosphorus in 513 BCE. Heading towards Levent via the Bosphorus Bridge and O-1 motorway. The bridge highway is eight lanes wide. Three standard lanes, one emergency lane and one pedestrian lane serve each direction. On weekday mornings, most commuter traffic flows westbound to Europe, so four of the six lanes run westbound and only two eastbound. Conversely, on weekday evenings, four lanes are dedicated to eastbound traffic and two lanes, to westbound traffic. For the first four years, pedestrians could walk over the bridge, reaching it with elevators inside the towers on both sides. No pedestrians or commercial vehicles, such as trucks, are allowed to use the bridge today. Today, around 180,000 vehicles pass daily in both directions, with almost 85% being cars. On 29 December 1997, the one-billionth vehicle passed the bridge. Fully loaded, the bridge sags about 90 cm (35 in) in the middle of the span. It is a toll bridge, and a toll plaza with 13 toll booths is situated near the bridge on the Asian side. A toll is charged for passing from Europe to Asia, but not for passing in the reverse direction. Since 1999, some of the toll booths (#9 - #13), located to the far left as motorists approach them, are unmanned and equipped only with a remote payment system (Turkish: OGS) in order to not delay traffic. In addition to OGS, another toll pay system with special contactless smart cards (Turkish: KGS) was installed at specific toll booths in 2005. Since 3 April 2006, toll booths accept no cash but only OGS or KGS. An OGS device or KGS card can be obtained at various stations before reaching the toll plazas of highways and bridges. In 2006 the toll was 3.00 TL or about $2.00. Since April 2007, a computerised LED lighting system of changing colours and patterns, developed by Philips, illuminates the bridge at night. In 2012, KGS was replaced with the new HGS system, which uses radio-frequency identification (RFID) technology. Daytime view of the bridge. Every October, the annual Intercontinental Istanbul Eurasia Marathon crosses the bridge on its way from Asia to Europe. During the marathon, the bridge is closed to vehicular traffic. In October, visitors participate in the 'fun run' and cross the bridge on foot. Many take picnics to enjoy the view. The bridge was depicted on the reverse of the Turkish 1000 lira banknotes of 1978-1986. On 15 May 2005 at 07:00 local time, U.S. tennis star Venus Williams played a show game with Turkish player İpek Şenoğlu on the bridge, the first tennis match played on two continents. The event promoted the upcoming 2005 WTA Istanbul Cup and lasted five minutes. After the exhibition, they both threw a tennis ball into the Bosphorus. On 17 July 2005 at 10:30 local time, British Formula One driver David Coulthard drove his Red Bull racing car across the bridge from the European side to the Asian side, then, after turning with a powerslide at the toll plaza, back to the European side for show. He parked his car in the garden of Dolmabahçe Palace where his ride had started. While crossing the bridge with his Formula 1 car, Coulthard was picked up by the automatic surveillance system and charged with a fine of 20 Euros because he passed through the toll booths without payment. His team agreed to pay for him. On 5 November 2013, World No. 1 golfer Tiger Woods, visiting for the 2013 Turkish Airlines Open golf tournament held between 7 and 10 November, was brought to the bridge by helicopter and made a couple of show shots on the bridge, hitting balls from the Asian side to the European side on one side of the bridge, which was closed to traffic for about one hour. On 15 July 2016, the bridge was blocked by a faction of the Turkish Armed Forces during a coup attempt. They also arrested civilians and police officers. Some tanks ran over vehicles. The soldiers involved surrendered to police and to civilians the next day. On 25 July 2016, prime minister Binali Yıldırım announced that the bridge would be renamed as the 15 Temmuz Şehitler Köprüsü (July 15 Martyrs Bridge). The bridge on the reverse of the 1000 lira banknote (1978–1986). Eurasia Tunnel, vehicular-traffic tunnel under the Bosphorus. Yavuz Sultan Selim Bridge, also called the Third Bosphorus Bridge, located near the Black Sea entrance of the strait. ^ Nebel, Bernd. "BRÜCKEN - Architektur, Technik, Geschichte". www.bernd-nebel.de. Archived from the original on 2016-01-14. Retrieved 2012-07-30. ^ "Bosphorus Bridge, TURKEY". g20.org.tr. Archived from the original on 2016-08-11. Retrieved 2016-06-26. ^ "The Story of the First Bosphorus Bridge – short film and talk". t-vine.com. 2016-05-13. Archived from the original on 2016-08-16. Retrieved 2016-06-26. ^ "Bosphorus Bridge renamed July 15 Martyrs' Bridge". TRT World. 25 July 2016. Archived from the original on 26 July 2016. Retrieved 26 July 2016. ^ "Turkey to rename Istanbul's Bosphorus bridge after failed coup victims: PM". Hürriyet Daily News. 26 July 2016. Archived from the original on 7 August 2016. Retrieved 26 July 2016. ^ "Turkey renames Bosphorus bridge after coup victims". New Europe. 26 July 2016. Archived from the original on 27 July 2016. Retrieved 26 July 2016. ^ Project Gutenberg. The History of Herodotus — Volume 2 – Retrieved on 19 March 2010. ^ Central Bank of the Republic of Turkey Archived 2009-06-03 at WebCite. Banknote Museum: 6. Emission Group - One Thousand Turkish Lira - I. Series Archived 2009-05-10 at the Wayback Machine, II. Series Archived 2009-05-10 at the Wayback Machine, III. Series Archived 2009-05-10 at the Wayback Machine. – Retrieved on 20 April 2009. ^ a b c "Venus Williams' match stretches two continents". Hürriyet. 2005-05-15. Retrieved 2009-06-25. ^ a b "Venus Williams Plays Tennis on 15 July Martyrs Bridge in Istanbul". Argus Photo Ltd. Archived from the original on 2011-07-07. Retrieved 2009-06-25. ^ a b "Coulthard smokes 'em over Bosphorus". Motoring. 2005-07-18. Retrieved 2009-06-25. ^ a b c "Bridge too far for Coulthard". BBC. 2005-07-26. Retrieved 2009-06-25. ^ "F1: 2005 Turkish GP". Motorsport. 2005-07-17. Retrieved 2009-06-25. ^ "Tiger Woods takes shot at Bosporus Bridge". Dünya. 2013-11-06. Archived from the original on 2015-07-03. Retrieved 2013-11-06. ^ Çoban, Cengiz; Ümit Türk; Ramazan Almaçayır; Dilhun Gençdal & Yaşar Kaçmaz (2013-11-06). "Tiger Woods hits ball on 15 July Martyrs Bridge". dha. Retrieved 2013-11-06. ^ a b "Turkey coup attempt: Crowds confront soldiers on 15 July Martyrs Bridge". BBC. 16 July 2016. Archived from the original on 17 July 2016. Retrieved 17 July 2016. ^ Bond, Anthony (16 July 2016). "Turkish soldier 'beheaded by pro-government mob on Istanbul's Bosphorus Bridge'". Archived from the original on 24 December 2017. Retrieved 5 April 2018. ^ "Turkey renames Istanbuls Bosporus Bridge 15th July Martyrs Bridge in honor of civilians who died resisting coup attempt". Washington Post. 2016-07-25. Archived from the original on 2016-07-26. Retrieved 2016-07-25. 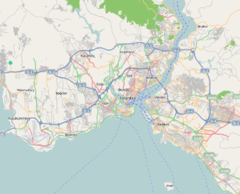 Wikimedia Commons has media related to Bosphorus Bridge. This page was last edited on 13 February 2019, at 03:09 (UTC).